The current affair involving William Jefferson Clinton and Monica Lewinsky is nothing new in the White House. Many presidents were well known to have had mistresses. President Thomas Jefferson fathered two children by his mistress, Sally Hemings, while he was living in the White House. On April 17, 1804, Maria Jefferson, the daughter of Thomas Jefferson by his deceased wife, Martha Wayles, died. Thomas Jefferson went to Monticello to attend the funeral, which was held two days later. Sally was waiting for him there. On January 19, 1805, exactly nine months later to the day of the funeral, Sally Hemings gave birth to the fourth of her five children by Thomas Jefferson. Obviously, the President and his mistress had decided to make up for the child who had just died. Thomas Jefferson named his newborn son Madison, after his Secretary of State, James Madison. 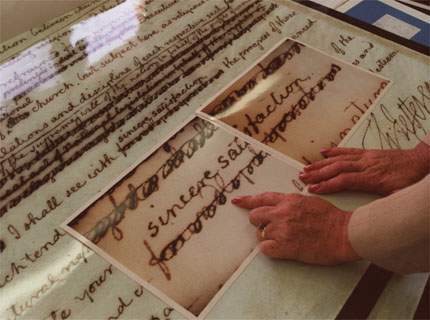 Thomas Jefferson left behind detailed records of his relations with his slaves, which provide overwhelming evidence of the nature of his relations with Sally Hemings. Here is one of more than ten thousand letters left behind by Thomas Jefferson. Another child, Eston, was born on May 21, 1808, while Jefferson was still president. Thomas Jefferson named his son Eston after the name of his traditional family home in England. Thomas Jefferson never denied his relationship with Sally Hemings. After he died, the Virginia State Legislature voted a special dispensation for her in recognition of the well known fact that she had been the President's mistress. Only Sally and her sons, Madison and Eston, were allowed to stay behind at Montecello. All of the other of the 187 slaves were disbursed. Jefferson's three older children by Sally had previously been freed. Yet, self proclaimed "defenders" of Thomas Jefferson still try to claim that no such relationship existed, in spite of the overwhelming evidence that it did exist. They try to blame these five children on nephews who were no longer living at Montecello when most of the children were born. The details of this entire controversy are revealed in "The Slave Children of Thomas Jefferson".